There was nothing but overgrown fields. But what was there felt real to us. We were captivated by this feeling from the very start at La Cerreta. We followed it and found the same harmony with Nature experienced by our grandparents, but which is overcome nowadays by the desire to master the environment. Later we were offered another gift: a thermal spring discovered by chance as we were searching for water for our livestock. We have left it free to gush and flow along streams and cascades, carrying its message of energy and dynamism to everyone. 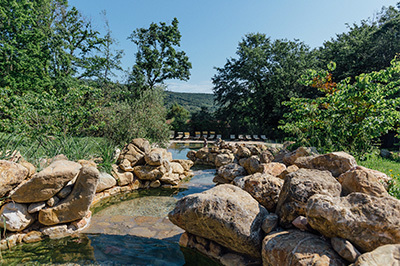 Le Terme di Sassetta spa is part of a extended wellbeing path, a piece in a mosaic comprised of listening, self-discovery and communing with Nature in the great system of earthly and cosmic energies. 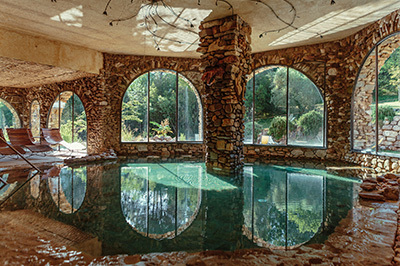 The effects of a thermal spring water unique in the world are linked with holistic pathways and treatments utilizing only fresh products from our kitchen gardens and farm, and combined with techniques and massages from ancient western and eastern traditions. This harmony of elements and knowledge follows the seasons’ natural rhythms and provides profound health benefits for the body and mind.